UDM Downloads > Break Excel File Password! Are you forget or lost your MS Excel Password? need to recover XLS password instantly then just download Best PDS Break Excel file password software which is the perfect solution to break excel file password or remove excel sheet password from your password protected XlS file in just few minutes. Advanced features based MS Excel password breaker tool easily break excel sheet password or break XLS password and helps you to open any unreadable password. Break MS Excel password software nice works with MS Excel Sheet and recover multilingual XLS spreadsheet password. You can break XLS password with the help of two analyzing process- Dictionary Attack, Brute Force Attack. There are some most appropriate attributes of PDS Break Excel File Password software like:- * Unlock excel password and remove XLS file protections. * Recover large size of MS Excel password * Gives you best and 100% result to remove forget password from your password protected XLS or XlSX file. 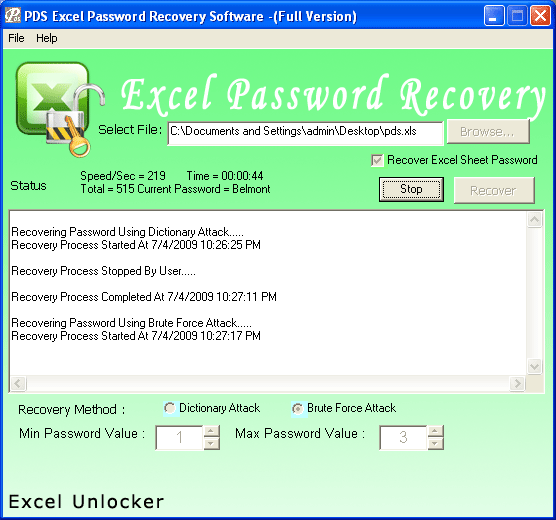 * Fully recover excel password of Microsoft Excel versions- 95, 97, 2000, XP and 2003. * Install and uninstall of supportive Windows:-97, 98, 2000, 2002, 2003, 2007, XP. * Provided online 24X7 technical supports. * Best availability of full and demo version of software Break excel file password, so just download free demo version of MS excel password recovery tool which can show you first 3 character of your excel password and if you need to get whole XLS password then just purchase full version of software from http://www.perfectpasswordrecovery.com/ with just 19 USD.